A down on his luck businessman strikes gold in the Indonesian jungle. It's 'Awards Season', which means one of Hollywood's beautiful people is expected to go overboard in the process of making themselves look like a regular member of the public. This year it's the turn of Matthew McConaughey to leap off the top of the ugly tree and hit every branch on the way down with the aid of prosthetics and a burger heavy diet. With his protruding teeth, beer belly and combover/mullet, McConaughey seems to have based his Gold look on the protagonists of last year's cult curio The Greasy Strangler. 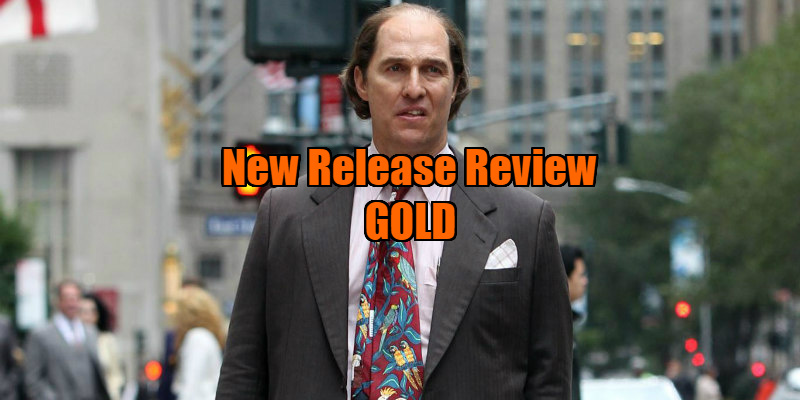 What makes this all the more odd is that in Gold, McConaughey isn't actually portraying a real-life character, but rather one loosely based on Canadian businessman David Walsh, who in 1993 became embroiled in a stock market scandal concerning his fake claims of discovering gold deposits in the jungles of Indonesia. Here, Walsh has been transformed into a fictional American named Kenny Wells, and the timeline has been unfeasibly compressed to a mere six month period in 1988. The real scandal broke in 1993, but I guess the filmmakers figured an '80s setting would allow for a better soundtrack. When we meet Wells first he's about to go broke, a situation we're told he's found himself in several times before. Following a dream (yes, a literal dream), Wells is inspired to travel to Indonesia and hook up with geologist Mike Acosta (Édgar Ramírez), who claims to know the whereabouts of the precious metal in that country's rain forest. Wells uses his questionable business savvy to raise just enough cash to begin a mining operation, and after some minor upsets, the pair strike gold, in every sense of the world, becoming multi millionaires in the process. We know at some point everything will go pear-shaped for Wells, as the film interjects brief flash-forwards to his interrogation by Toby Kebbell's FBI agent, but it takes until the final third of the movie for the rug to finally get pulled from under his feet. For the majority of the film we're simply watching a rich guy get progressively richer. When the big twist is eventually revealed we're left baffled as to why we couldn't have been given this information a lot earlier, as it would have added a much needed element of drama to a narrative sorely lacking in that key storytelling element - conflict. If you've seen last year's War Dogs, you've already seen Gold. Their plots are practically identical, with both featuring a naive but well meaning and aspirational (read 'All-American') white guy led astray by the dodgy tactics of his minority colleague. Both stories are told in that sub-Scorsese fashion so beloved of filmmakers bereft of their own ideas - all tracking shots, close-ups of substances being imbibed, arguments with angry spouses and on-the-nose needle drops (a scene in which Wells walks away in silence is accompanied by Joy Division's lyrics, "Don't walk away, in silence."). Gold doesn't boast an over-the-top performance like that of War Dogs' Jonah Hill, but it sure could use one. Anything to bring life to this dramatically inert piece of McConsense would be more than welcome. 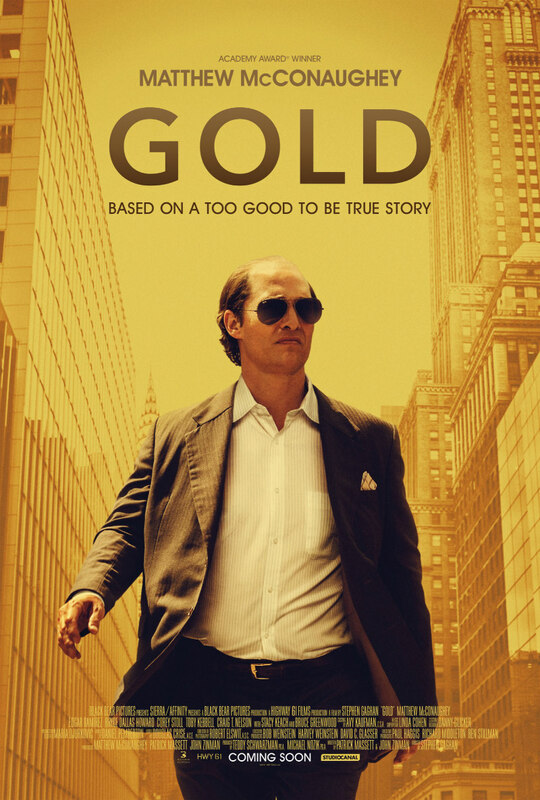 Gold is in UK/ROI cinemas February 3rd.